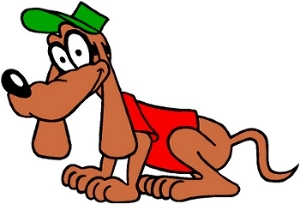 Story: Ottoperotto is the Beagle Boys' pet and occasional helper. Being a part of the Beagle Boys, he is also a part of messing up their heists. Background notes: Dogs looking like their owner and heroes being accompanied by man's best friend is a common theme in comics. Superman had Krypto, Batman had Ace, Dagwood Bumstead had Daisy, Sergeant Orville P. Snorkel had Otto, etc. In the Italian comics, the Beagle Boys were given the dog Ottoperotto, complete with mask, cap and red shirt with a serial number. The name Ottoperotto is a pun on otto per otto i.e. eight by eight in Italian, or 64 which is his serial number. The first record available on Ottoperotto so far, is Almanacco Topolino #86 from 1964, where he appeared in a story called Zio Paperone e le bande rivali by Pier Carpi and Giovan Battista Carpi. The character was only used in a few stories from 1964 to 1966, and with the exception of a few stories the character was not seen in new material until 1999, when the Italians started using the character on a regular basis. For the most part he has been a part of the stories with the Beagle Boys, but he did get a series of solo stories titled Ottoperotto cane bassotto (i.e. Ottoperotto Wienerdog) back in 2003. So far the only references to the character being transferred to other media is a figurine from Italy.